For more details about host routing with PowerCLI 4.1, see the cmdlets help and the online documentation. This entry was posted in Uncategorized on July 30, 2010 by Irina Nikolova. While automating with PowerCLI scripts, you have most probably stumbled upon a situation when you need to access the parent of an object – the virtual machine of a CD drive, the host of virtual machine, the cluster of a host etc. In PowerCLI 4.0 U1 all object types which have “parents” are enhanced with the “Parent ID” property. Using this property you can easily get the parent object by invoking the corresponding Get-* cmdlet and filtering by ID. In the latest PowerCLI 4.1 release these “child” object types are enhanced with an even more useful nested property which holds the parent object itself. Using the nested parent object you can access the parent right away without the need to invoke an additional Get-* cmdlet. Here is a simple example that illustrates the reference to the parent objects in PowerCLI. Let’s assume you have retrieved a virtual machine from your environment and for some troubleshooting reason, you need to check the time zone of the host where the virtual machine is running on. To do it, you have to access the host (parent object) of the virtual machine and get the value of its Timezone property. > $vm = Get-VM -Name "myVM" -Location "MyCluster"
In addition to the child-to-parent relationship, nested properties are also used to represent another type of relationship: objects which are uniquely identified with another object. For example, besides the new “Parent” property, the “VMHost” type now has “StorageInfo”, “NetworkInfo”, “VMSwapfileDatastore”, “DiagnosticPartition”, and “FirewallDefaultPolicy” properties which let you know a whole lot more about a virtual machine host by just navigating through these properties. The new nested properties are initialized on demand, i.e. they will not be populated until the first time you access them, so no performance loss is expected when retrieving an object which has a parent property. Note that in future releases we’ll deprecate the old “Parent ID” properties so stick to nested properties when you need to access an object’s parent. There are certain events in life that we all strive to avoid, yet they seem practically inevitable. Facing problems, when using some software product is one of those. 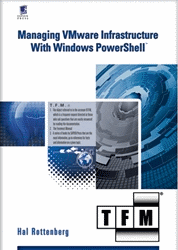 And using PowerCLI and vSphere makes no exception. Occasionally, you will stumble upon a configuration, environment, or a PowerCLI/vSphere problem itself. This article shows how you can effectively report the problem to VMware. You will need this if cannot solve some problem yourself and need outside help or just want to inform VMware about the problem so they can fix it at some later point. Reporting a problem with PowerCLI is easy. What you have to do is generate a diagnostic bundle with the Get-ErrorReport cmdlet and send it to VMware (or someone else with enough expertise on PowerCLI). There are 2 main scenarios for reporting the problem. The first is sending the bundle to VMware tech support (if you have a tech support account). The second is to post it in the PowerCLI community forum (http://communities.vmware.com/community/vmtn/vsphere/automationtools/powercli), attach the bundle to your post, and wait for someone to take a look at it. Here is the online documentation of the cmdlet: http://www.vmware.com/support/developer/PowerCLI/PowerCLI41/html/Get-ErrorReport.html. -ProblemScript is the Powershell script that reproduces the problem. Get-ErrorReport executes this script and captures all the actions caused by it, so someone at VMware can be able to analyze them later. -ProblemScriptTimeoutSeconds is the time limit in which the script must finish execution. If the script exceeds this time limit it’s considered an error. This parameter is needed because Get-ErrorReport cannot know what time an arbitrary script should take, so it cannot know if the script has blocked or is still operating as expected. -ProblemDescription is your description of the problem you observed. It should be as specific as possible. It should describe what the erroneous behavior is and what the expected behavior is. -Destination is the directory where you want to save the diagnostic bundle. It’s a .zip file. -DontIncludeServerLogs specifies if vCenter logs should be captured as well. If this switch parameter is not set, the cmdlet will extract the vCenter logs + the logs of all ESX servers managed by the vCenter. This is quite a slow operation and will increase the size of the diagnostic bundle dramatically. Including vCenter logs is useful if the problem you’re reporting is on the vCenter/ESX side. So it’s better to set this parameter if you report a PowerCLI-specific problem. Let’s see some examples now. Let’s say you have a problem moving a virtual machine from one host to another. You can assign the script that moves the virtual machine to a variable and pass it to Get-ErrorReport. Let’s say you want to connect to a server and retrieve the virtual machines but the operation hangs. Again, you can create the script that gets the virtual machines and pass it to Get-ErrorReport, specifying that you expect that the script should take no longer than 60 seconds to finish. Let’s assume you also want to include the vCenter logs in the report. Now you know how to record diagnostic information that will help someone with PowerCLI expertise understand your problem (and hopefully provide a solution). This someone will probably be VMware tech support (for those of you who have a tech support account) or the PowerCLI community forum where someone from VMware or the community can hopefully take a look at it. – A snapshot of the Powershell session state before and after the script execution. This snapshot includes all the Powershell variables and their values (the contents of the PSCmdlet.SessionState object). – [Optionally] The vCenter logs. PS. Any information that is previously known to be sensitive (like passwords used when authenticating to the server) is not included in the diagnostic bundle. But, note that if you have a clear-text password stored in a Powershell variable – it will go in the log, since there is no way for Get-ErrorReport to know that some arbitrary variable contains a password. This entry was posted in Uncategorized on July 23, 2010 by Dimitar Hristov. Complex scripts need to handle errors and resolve common error scenarios without user interaction. A step in that direction is exposing the entire specter of vCenter server error hierarchy along with PowerCLI specific exceptions (for example when validating input parameters). In addition to this feature the full exception chain is available in the error records as inner exception. So if the error is PowerCLI specific exception, the inner exception can be used to get the underlying vCenter Server error. Thanks to that you can easily tune your script to check the returned by the server NoDiskSpace MethodFault and deal with it specifically. These cmdlets are script-based and this makes them user-customizable. By default, they are supported on Windows (XP, 2003) and RedHat 5 guest operating systems. But if you want to execute the cmdlets on a different guest OS, you can extend their guest OS support either by modifying the existing scripts, or by adding your own ones. The scripts are located in the PowerCLI installation folder: “<Install_Folder>\Scripts”. The script names follow this convention: <operation_identifier>_<guest_OS_identifier>[.bat]. The operation identifier is “GuestDiskExpansion” for Set-HardDisk and the cmdlet name (without dash between verb and noun) for the VMGuestNetworkInterface and VMGuestRoute cmdlets (e.g. “GetVmGuestNetworkInterface”). The OS identifier should be either an OS family (e.g. “WindowsGuest” or “LinuxGuest”) or a specific OS version – guest id (e.g. “winXPProGuest”). You can see the guest id using Get-VMGuest cmdlet. The script extension must be “.bat” for Windows scripts and must be omitted for Linux scripts. When you pass a collection of VMs to one of these cmdlets, the cmdlet checks the guest OS and chooses the most appropriate script for each VM. In short, this is how it works: PowerCLI searches for a script for the specific guest id (specific OS version) of the VM and if there is such a script – it uses it; if no such script is found – PowerCLI checks for a script that matches the guest OS family and uses it. In this way, you can have a specific script for a specific OS (e.g. Windows 7) and use the common OS family script (e.g. Windows) for all other OS versions (e.g. XP, 2003). Each script receives its parameters in a specific order and must also print its output in a specific format. Each predefined script contains a comment at the beginning which describes the expected parameters and output. You can either modify the existing scripts or write new ones (e.g. for a specific OS version). Either way you need to ensure that the script handles the expected parameters and prints the expected output – only then the cmdlet will be able to use the script. This entry was posted in Uncategorized on July 21, 2010 by Dimitar Hristov. At last vDS features are here with the new PowerCLI . The vSphere PowerCLI 4.1 release is the first touch of PowerCLI with vNetwork distributed switches, so please don’t expect to find fully supported vDS functionality in it. Still as you probably know, the Get-View cmdlet provides an opportunity to add extra functionality to your PowerCLI scripts. What you’re going to find in this post is how to create virtual network adapters on vDS and how to move VMs in and out of a vDS. At the bottom you can find a sample function that creates vDS. The sample function below creates vDS, using the vSphere SDK for .Net. First, the function creates DVSCreateSpec, where vDS name and uplink port names are populated (Note that the name of the class matches the previous name of the vDS – “distributed virtual switches”, instead of “vNetwork distributed switches”. So don’t be confused of that ). Then the function creates DistributedVirtualSwitchHostMemberConfigSpec, where it populates the host(s), which will be added to the vDS. For the example I am adding a single ESX host, but you can modify the function to add a collection of hosts. For the added hosts, the function specifies the physical network adapter ID, which will be used for the connection to the vDS, which is done by adding DistributedVirtualSwitchHostMemberPnicSpec. Next, the function creates the vDS using CreateDVS method of the network folder view. Then the function creates DVPortgroupConfigSpec and adds a port group using the AddDVPortgroup method of the vDS view. Finally the function returns the managed object reference of the vDS. One thing you have to remember is that you won’t be able to remove your vDS until there are virtual adapters available there. I hope that you’ll find this post somehow helpful and that it will make you feel a little bit more comfortable, when working with vNetwork distributed switches . This entry was posted in Uncategorized on July 20, 2010 by Pavel Dimitrov.